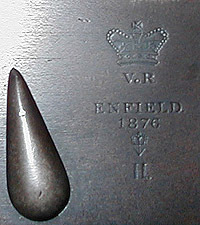 The right side of every British Military Martini-Henry bears a Queen's, or Sovereign's Cypher. The Sovereign's Cypher is a collection of separate markings, consisting of the following: Royal Cypher (crown), Manufacturer's Code, Year of Manufacture and the Lock Viewer's Mark. 1. The Sovereign's, or Royal Cypher. 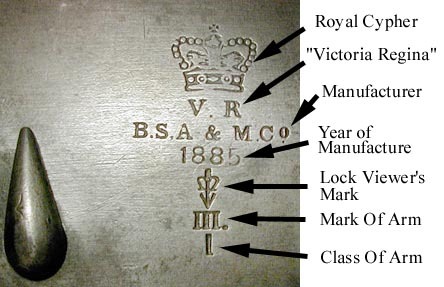 Military Martini-Henrys will bear the Queen's Cypher, accompanied by Victoria's initials, "V.R." for "Victoria Regina" (Latin for "Queen Victoria"). 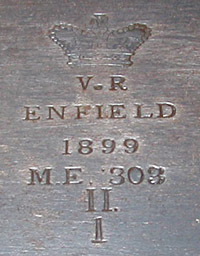 After Victoria's death in 1901, the throne was assumed by King Edward VII and King George V. Martinis manufactured, or converted to .303 after Victoria's death will bear a Sovereign's Cypher with a King's, or Tudor Crown, and the initials E.R. or G.R. (for "Edward Rex" or "George Rex"..."Rex" being Latin for "King"). BE Co. - Blenheim Engineering Company Ltd.
BSA & M Co. - Birmingham Small Arms & Metal Company Ltd.
HRB Co. - Henry Rifled Barrel, Engineering and Small Arms Company Ltd.
LSA Co. - London Small Arms Company Ltd.
NA & A Co. - National Arms and Ammunition Company Ltd.
3. Year of Manufacture. The year in which the weapon was built. A work year ran from April, 1 to March, 31 of the following year. Sometimes, the fourth digit in the date code will be seen engraved instead of stamped, and sometimes stamped off center in comparison to the other three digits of the year. 4. Lock Viewer's Mark. In the time of muzzle loading weapons, this marking was applied to indicate that a Lock Viewer, or an inspector specializing in rifle locks had inspected the lock for correct function, and adherence to the specified pattern. It served the same purpose on Martinis, the internals of the action body being the "Lock". This marking was found to be superfluous, and was not applied to weapons dated 1898 or later. Each manufacturer had minor variations in their Lock Viewer's Mark. These markings are detailed on the Lock Viewer's Mark Page. Another marking of note on the Sovereign's Cypher side of the action body is the "Class of Arm" marking. Martini-Henry's were placed in two classes. First Class Arms were frontline, current pattern weapons. Second Class Arms were those of obsolete patterns, examples with more wear, or weapons thought to be generally less "frontline ready". As you can see by this Martini-Henry Mark III Infantry Rifle's markings, it was a First Class Arm. Second Class Arms were often sent to training units, or home guard/militia units. Note the small cocking indicator, characteristic of this pattern Martini. An example Sovereign's Cypher from a Martini-Henry Mark II Infantry Rifle. Directly below the Lock Viewer's Mark is the "Mark of Arm" marking. In this case, the Roman Numeral "II". Often times there will be a "." following the last digit. This is sometimes referred to as a "stop". Sometimes when a weapon was upgraded to a later Mark, this marking will be modified to suit. This is easily identifiable by added characters being struck deeper, lighter, off center, or a combination of these. Here's an example of an "off-center" character. Notice how the second "I" in the Mark of Arm marking is off center. This rifle started life as a Martini-Henry Mark I Infantry Rifle. At some point, the weapon was upgraded to the Mark II Pattern, and an additional "I" was applied to the right of the original. The left side of the action body on a Martini-Enfield. Typically, any Martini-Henry converted to .303 caliber will indicate the year of conversion and other particulars about the conversion here on the conversion cypher. "1899" is the year this weapon was converted to a Martini-Enfield. "M.E. 303" indicates that the weapon was converted to a Martini-Enfield. A .303 caliber barrel with Enfield pattern rifling was fitted, and thus was born a Martini-Enfield. "M.M." would indicate a barrel with William Metford's pattern of rifling had been installed, thus producing a Martini-Metford. 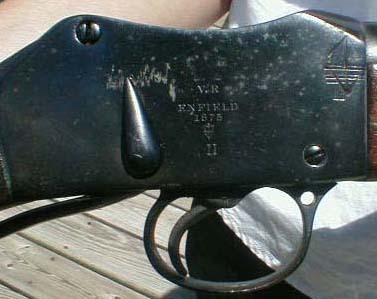 The "II" indicates the weapon was converted to a Martini-Enfield Mark II pattern, and "I" indicates the weapon is a "First Class" weapon. 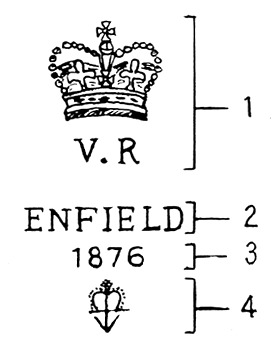 Notice the absence of a lock viewer's mark, as the conversion was done post 1897.